iCAPS Ltd offer an extensive range of training courses on both our own software products and also those of Sage and Pegasus. The format of the courses varies, either a number of different companies can attend a set course on a given day or training can be tailored to meet a customer’s specific requirements. 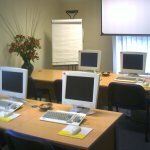 Courses are held in our purpose-built training rooms at our headquarters in the Cotswolds and are run throughout the year.